Our team has discussed these issues in some detail already. The topic of competitiveness is discussed here. The very important notion of economic clusters has been covered in two texts: Comment 20 and Comment 21, the latter offering this fine image, showing purchasing power across Europe. We discuss the need to renew the industrial portfolio in many comments, but in particular in the companion paper on the substance of the New Narrative. In this text, we try to take a cross sectional look at national activity, with an eye to finding regularities. WE begin with a specific case study: the US. Porter and Rivkin (Prosperity at Risk HBS 2012) set out to gather the opinions of the Harvard Business School alumni, who now number hundreds of thousands of senior managers scattered around the world. 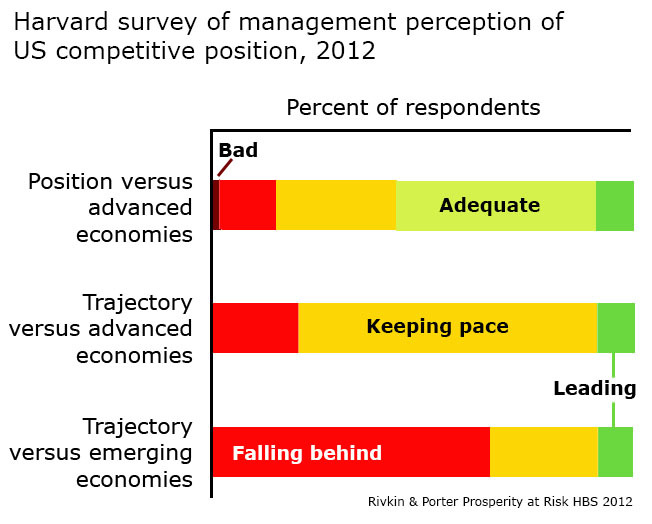 Their views on US competitiveness are negative, and give clear indications as to why. The figure shows their assessment of the current situation and the "trajectory", the way in which relevant events seem to be developing. The next figure shows the response of this group to specific areas of concern. It addresses the US in comparison to other industrial countries - its current position and the relative trajectory that it and its competitors were following. The four quadrants represent combinations of these - for example, in the top right the US both leads its competition and is drawing away from them. In the lower left, it is already worse and becoming more so. It is worth noting that the scale - not shown, but proportional - strongly emphasises the negative. Thus they evaluate the "political system" as being about three times as bad as the very best characteristic - "universities" - is good. Virtually all of the "bads" are things which the state manages. Entrepreneurship, innovation and clusters are all issues that this paper addresses. The New Narrative paper also picks up on most of these issues. They are what we have called "intangible infrastructure", discussed in detail in the two papers that are referenced at the head of this text.. Innovation is important for three reasons. First, it is how the portfolio of activity is kept fresh. All commercial activity tends to converge around a common cost base. In doing so, the industry consolidates into a few, generally very similar players. Their costs are nearly identical. The market price is set by the marginal cost of the marginal producer, which is necessarily much the same as the unit cost all the others. Unit margin is, of course, the difference between price and cost, which is therefore low for the entire industry. Such an industry is described as being "commoditised" - through huge scale, it may generate formidable profits, but these are not impressive when compared to the assets that it has to deploy. Innovation re-starts this process of commoditisation. It changes what was a flat supply curve for many players to a sharply sloping curve with only a few firms at work. Profits are high compared to the assets employed and capital markets become excited. The result of this is fast sector growth, high uptake of labour and a general stimulus to the economy. New companies are usually inefficient in their use of people, and so tend to absorb a great deal of labour. Second, product innovation gives us new capabilities, and process innovation makes what we do safer, cheaper or more reliable. This is welcome. Arguably, attractive new products increase the incentive to consume, usually a good thing for economic growth. Third, innovation often runs in parallel with entrepreneurial activity, and probably springs from much the same psychological roots and certainly from similar practical goals. Policy makers who think about innovation tend to have one or two a stereotypes in mind: the start-up, manned by young technologists, and the corporate laboratory, grinding out a new product. However, the plain fact is that almost all take-up of new technology occurs within large, established organisations, and that almost all of the information that they use was generated by someone else. Around 3% of start up companies survive the first three years of life. It is not hard to see why, Getting a new business up and running requires many parallel processes to work, from financing to human resource, from marketing to law. If we say that there are eight of these,m and that there is a fifty percent chance of getting each one right first time, the the chance of all of them being right is 0.5^8, or a 4% chance of success, close to the observed number. Large companies, by contrast, have most of these things already in place and have the luxuries of pilots, of trying again. They fail only when they decide to stop trying. Innovation is also generally a matter of accretion, of slow change around clear goals. It may be the goals that are changing, or the means to deliver on them. When the goal is clear - particularly if it is a specification that is known years in advance, then is it relatively easy to come up with solutions to defined problem: a car for this kind of consumer, a sat nav for under this cost. Organisations that crank out new models or attempt new feats of mineral extraction are, in effect, fulfilling long-defined goals. There is no blinding revelation, no game-changing product that throws the competition into confusion. Indeed, technology suppliers are generally adept at putting themselves in the shoes of their client organisations, defining the problems they need to solve and then delivering a solution. Innovation processes and needs varies sharply from country to country and from sector to sector. Middle income countries are usually catching up with extant technology and best practice. The chief innovation is finding where these possibly expensive or large-scale applications have local relevance. Wealthy countries are usually "inventing the future." The interest in innovation varies hugely between industrial sectors. Success in mineral extraction, for example, essentially comes down to good deposits and good tax and regulatory regimes, with extraction technologies generally a poor third behind these. In industries in which the building blocks can easily be shuffled around - in electronics, software, entertainment, for example - then novelty is at a premium, new things are generally ephemeral and intellectual property is very important. In yet other industries, issues such as regulatory compliance, customer trust and brand are of central importance, and innovation is subservient to these. Organisations that are appropriately innovative have the systems in place which answer to location, sector and position which the company takes in regards to change. Some organisations choose to follow rather than to lead novelty and best practice. Others prefer to lead, taking both risks and occasional high returns. The Global Entrepreneurship Monitor (GEM) has collected data in 54 countries for around 150,000 people. The industrialised countries and emerging markets are very similar in the degree to which they support entrepreneurship However, entrepreneurs report very different issues as limiting what they can do. They identified twelve fairly obvious issues that help entrepreneurs to succeed - access to finance, state-based science and consequent technology transfer, a predictable environment and so forth. In general, the poorer the country, the less the found that entrepreneurs felt themselves empowered to operate. Poor-country entrepreneurs felt unable to score their country positively on not one of the twelve key items. By contrast, all were scored as being positive by their industrial world equivalents. Those items that sat close to a negative assessment in the industrial world were entirely cultural: the social norms, the facilities for training after formal education, the dynamics of the internal market that created barriers for entrepreneurs. In the poor nations, the issues which scored most strongly were precisely those that were scored badly by the rich nations: culture and training. Everything else was bad, particularly where the state impinged on commerce, or where access to technology was required. Poor countries start a lot of new businesses, but their survival rates are very poor as compared to those in developed economies. Entrepreneurs in poor countries tend to start customer-facing businesses that are set up to serve unfulfilled needs. This diminishes in favour of business-facing activities in richer countries, which tend to offer alternative ways to serve an existing need: for example, outsourcing. Poor nations report that entrepreneurial activity is limited by access to knowledge in poor countries, whilst giving access to technical insight is ranked as an important element of service provision in the rich world. We gave combined GEM data with figures from the Global Innovation Index. The result shows that there are a number of correlates between observed innovation and attitudes towards entrepreneurs. The figure shows, on the left, the global innovation index for 2012 for selected countries. Switzerland tops the list, followed by a list of industrialised countries. China sits in the middle of the list, Venezuela and Pakistan at the foot. Specifically entrepreneurial activity does not follow this pattern. Middle income countries tend to show the highest rate of start-ups (and failures) with Chile at the top of the list. In this sense, the US is less entrepreneurial than Argentina. However, as GEM notes "while there are fewer entrepreneurs in the [wealthy] economies, those that do exist are more likely to affect their societies through growth, innovation and internationalization." 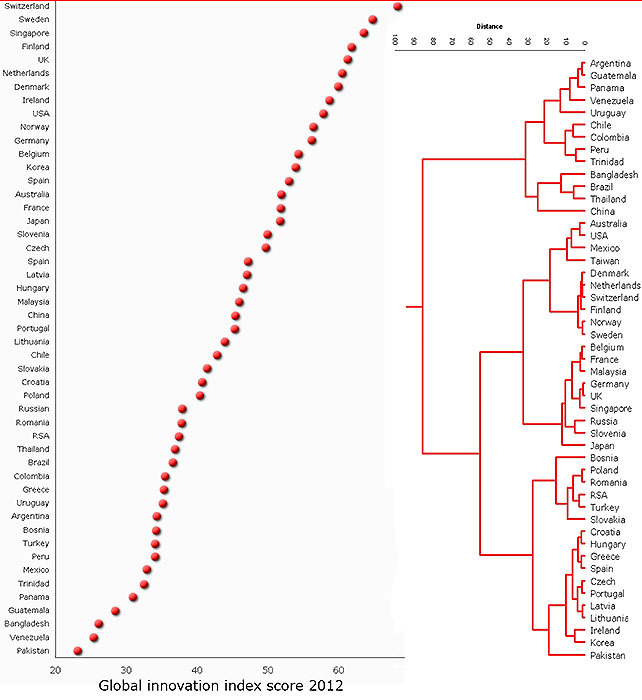 On the right, the nations are clustered according to the data. We see two broad families, one (top) predominantly made up of middle income countries: they are entrepreneurial but not very innovative. 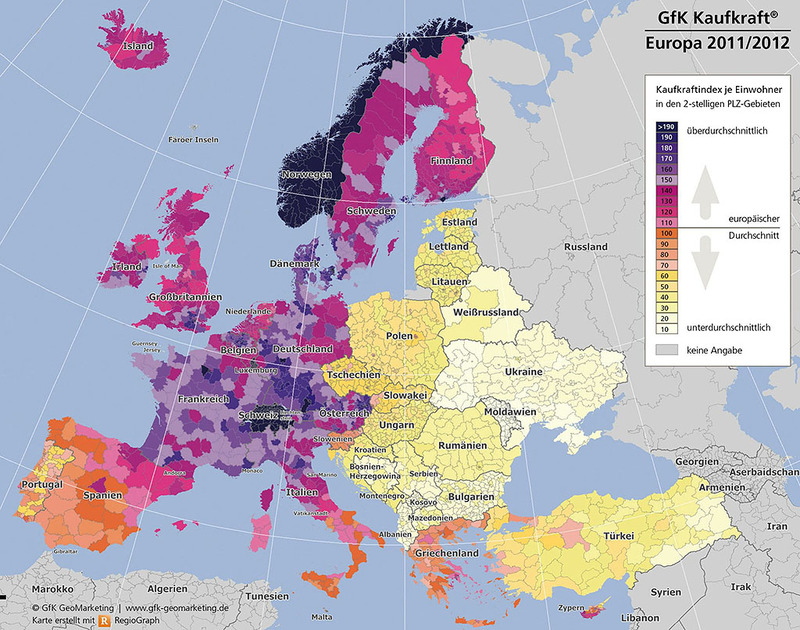 The second families are characterised by (bottom) European middle income countries and in the centre, by a mélange of middle income and chiefly industrial nations. These fall into sub-families that are surprisingly coherent to read, although it is hard to say why. This analysis explains around 70% of inter-country variance in innovation rates. Half of this is due to differences in human resource - chiefly, skills - and by social attitudes to commerce and innovation. Examples of such attitudes is the prevailing view about the relative benefit of choosing an entrepreneurial or conventional career path, or perhaps the society's approval or otherwise of entrepreneurial activity. GEM found that people who organise innovation within their own organisation are extremely rare: perhaps 3% of the adult population. This varied considerably between nations, from high scores in Denmark, Sweden and Finland to zero in Iran, Pakistan and Jamaica. Nations scoring higher than average include the US, UK, France, Belgium, Netherlands, Australia, Uruguay. Entrepreneurship is associated with people of high education, typically in their 30s and 40s, chiefly men and often prone to leaving their firm - perhaps in frustration - to start businesses of their own. Some 70% of them have been responsible for introducing new methods, products or processes into their organisation, and to those of the customer base. Intrapreneurs are often frustrated. It is virtually impossible for anyone who is not either directly tasked by senior management, or in senior management themselves, to generate significant direct change. An individual with a mission is, in effect, saying that everyone else is wrong, and in particular, that those managing the affected activity is unintelligent, lax or mistaken. This does not make friends. Companies are generally set up to manage straightforward things in the simplest possible manner. Making complications also does not win friends. Where the change is at the Suggestions Box level - "here is a clear problem, and this solves it" - then solutions may be adopted. 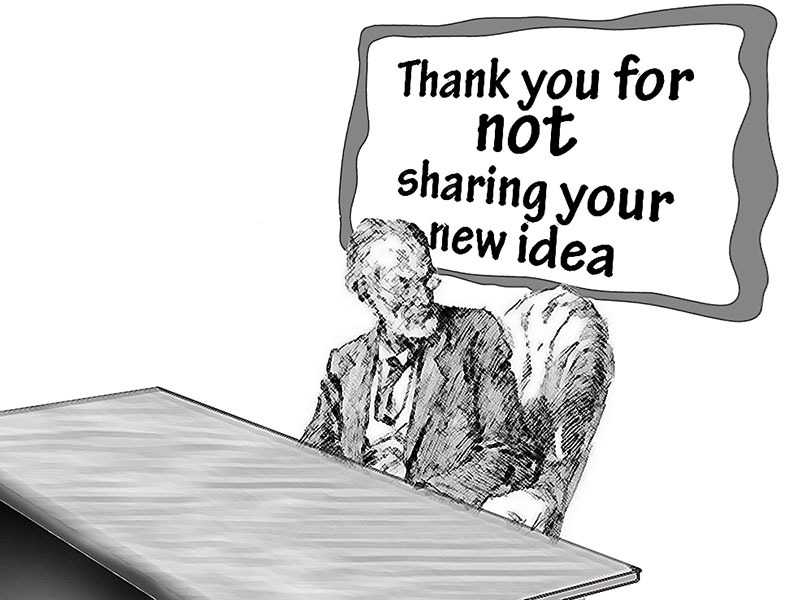 Appeals to "rethink our business" generate hostile reflexes. The answer to this issues is, invariably, process. Simple innovation occurs through collective discussions: quality circles, continuous improvement schemes and the like. These never produce revolution, in the short run, but they do generate progress. Revolutionary change comes when a large number of minds are prepared in advance. Procedures need to exist for this to happen. One set of procedures has to define the business environment - from how money is truly made in this industry - costs, markets, regulation, rents such as intellectual property and scale, technologies and customers - and how competition functions, once again addressing everything from brand to cost curves, routes to market and supply chains. There needs to be insight into how this is changing, and what might change it: technology, regulation, new entrants. Second, the firm itself needs to understand its role in this system. How is system segmented and where are they strong and where are they weak? What options are truly available to them, given realism, resources and ambitions? Given all of this, the firm has to ask itself what is its character? What is it that they really want from the insight that they have gained and the realistic options that seem to be open to them? Finally, the organisation needs to talk in depth with its staff and wider supporter base. This is a conversation with two aims. First, in needs to tap the knowledge base in order to gain all of the insight discussed above, for what do senior managers, years from their training and customer contact, really know about forthcoming technology, customer attitudes and so forth? Second, the people with contact to potential solutions are very often those deep in the organisation, facing customers, suppliers and sources of technical information. If they do not know what questions need to be posed and answered, then it is extremely unlikely that they will find this information. In addition, if someone does by change stumble upon something potentially useful, an unprepared organisation will almost certainly fail to recognise this as useful and block it. If the discoverer is several layers down in the organisation from those charged with "strategic" matters, then the chances of innovative ignition are essentially nil. This approach exists in some small, highly focused organisations. It does so not through design so much as by means of spontaneous social interactions. This will not happen if the organisation has complex or blurred imperatives, if it is organised into separate business units or if everyone is too busy to talk. It will never, ever happen spontaneously in large organisations. On occasions, a magic figure emerges who has somehow packed all of this into their head, and the business prospers for a while. Distractions or the changing world tend to invalidate these insights and then the organisation hits an invisible wall. Some large organisations have installed some parts of this structure. Shell's scenario planning process offers some of the necessary element, for example. Others - notably, state enterprises - maintain immense laboratories that never deliver anything of use, because they have no idea what is wanted, Senior management have no idea of what is possible. The organisation proceeds by copying others, by purchasing innovative technologies and or companies, through the extensive use of consultants who deliver a generic package to which senior management can relate but which has limited organic connection with the firm as a whole. It is strange that these processes are not more widely adopted, as they cost next to nothing, serve as an excellent training ground for potential senior management and deliver direction and innovation. The reason for weak take up is, perhaps, because senior staff see a certain inherent risk - of loss of control, of distraction of attention, of being shown to be ignorant, of a momentum developing that takes them where they do not want to go. Equally, it is not clear how to set such a system up and there are no providers who deliver such a product. GEM note that there is no prescription that fits all nations. Equally, the needs of entrepreneurs vary very much with the economic status of the country. Institutional and cultural factors are at least as important to success as strict business economics. However, noting the list from Harvard - above - that is not a bad place to start. The state-related issues - very complex taxes, poor primary education, a weak political (policy) process - are particularly tractable to reform. Human resource can be limiting in other ways. In the wealthy countries, restrictive labour laws are a major disincentive to entrepreneurship As new companies tend to be inefficient in their use of people, new small businesses are disproportionate employers. Such policies therefore have paradoxical effects. A major limit for all start-up companies is access to finance. There is a stage at which personal finance fails, but banks are unwilling to lend. Venture capital tends to support ventures where there is an established cash stream, such as MBOs or plant extension. The delays involved in financing may also bring down ventures that simply sun out of maintenance cash. These projects are indeed risky, but a fraction of them are supremely profitable. That fraction expands sharply if they are given the right management at the right time, for example through so-called incubator parks. It is strange that that has not yet been a marriage of the general finance industry, which is so good at bundling risks, and private equity, which excel in providing timely management and phasing finance with the delivery against targets. An "innovators fund" that had both of these characteristics ought to be highly rewarding, insofar as it meets a major need and, at least in potential, offers access to unprecedented profitability. From GEM: "Governments ensuring that political interests do not supersede economic concerns are also more likely to create conditions in which entrepreneurs can grow and prosper."